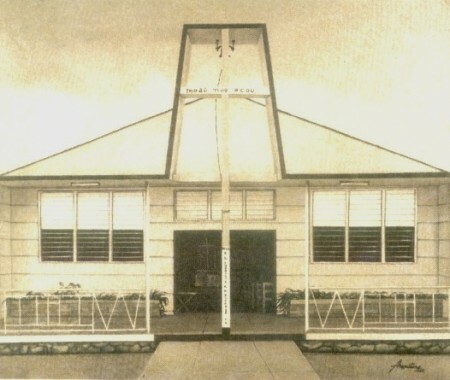 This September will mark the 50th year anniversary of the Rio Abajo Methodist Church with a unique history linked to Panama’s West Indian community. According to Fred Howell’s brief history of this church which you can read here, the beginnings of this institution of worship dates back to 1950. It was in that year that the Wesley Methodist Church, part of the Jamaica District, obtained approval from the Synod to create a Methodist Society and build a church in Rio Abajo, then considered the “outskirts” of Panama City. For several years Sunday School and evening worship services were conducted in the basement of a faithful member’s home, Mrs. Agnes King and in that same year the purchase of a lot was negotiated by Rev. Pratt. The lot on 13th Street in Rio Abajo is the home of the Rio Abajo Methodist Church to this day and it continues to serve a congregation of about 188 members. The title to the land, according to Howell who eventually became its first Society Steward, was secured by Rev. William Armstrong. According to the news release, it was Rev. Ephraim Alphonse who inaugurated the church in September of 1962, the year it was completed and opened. Their normal worship services are on Sundays at 8 AM for English services and 10:30 AM for Spanish language service. The church has become an icon in the Rio Abajo community and it is located on 13th Street. Should you wish to know more about their upcoming activities in September, you’re welcome to contact them by e-mail at rio_methodistatyahoo.com (just replace the word “at” with the @ and you can safely access the church’s e-mail). Their direct phone number is (507) 224-4714. The press release invites all interested persons to attend the “Golden Anniversary Communion Bilingual Service, which will begin by processing from the entrance of 13th Street up to the gates of the church, and accompanied by a musical band to the tune of the hymn The Church is one Foundation. Guest preacher will be the Reverend Peter J. Perowne, the first appointed minister to that church. Everyone is welcome. GOLD has been chosen as the color for the Anniversary month. On Sunday, September 9, 2012 at 1 p.m. The Rio Abajo Methodist Church 50th Anniversary Luncheon will be held at Hotel Riu Plaza, located on 50th Street, Panama City. Donation is $50 per person. An anniversary commemorative booklet will be printed for the occasion.” For compliments and ads you may contact the church for further information. The image featured in this article, by the way, is a painting of the church edifice by Eduardo Augustine, a Panamanian painter, dating from 1987. This entry was posted in Church in Panama, Methodist Church and tagged Bishop Ephraim S. Alphonse, Fred Howell, Methodist Church of Rio Abajo Panama, Rev. William Armstrong, Rio Abajo. Bookmark the permalink.